Atoms are made up of particles called protons, neutrons, and electrons, which are responsible for the mass and charge of atoms. An atom is composed of two regions: the nucleus, which is in the center of the atom and contains protons and neutrons, and the outer region of the atom, which holds its electrons in orbit around the nucleus. Protons and neutrons have approximately the same mass, about 1.67 × 10-24 grams, which scientists define as one atomic mass unit (amu) or one Dalton. Each electron has a negative charge (-1) equal to the positive charge of a proton (+1). Neutrons are uncharged particles found within the nucleus. atom: The smallest possible amount of matter which still retains its identity as a chemical element, consisting of a nucleus surrounded by electrons. proton: Positively charged subatomic particle forming part of the nucleus of an atom and determining the atomic number of an element. It weighs 1 amu. neutron: A subatomic particle forming part of the nucleus of an atom. It has no charge. It is equal in mass to a proton or it weighs 1 amu. An atom is the smallest unit of matter that retains all of the chemical properties of an element. Atoms combine to form molecules, which then interact to form solids, gases, or liquids. For example, water is composed of hydrogen and oxygen atoms that have combined to form water molecules. Many biological processes are devoted to breaking down molecules into their component atoms so they can be reassembled into a more useful molecule. Atoms consist of three basic particles: protons, electrons, and neutrons. The nucleus (center) of the atom contains the protons (positively charged) and the neutrons (no charge). The outermost regions of the atom are called electron shells and contain the electrons (negatively charged). Atoms have different properties based on the arrangement and number of their basic particles. 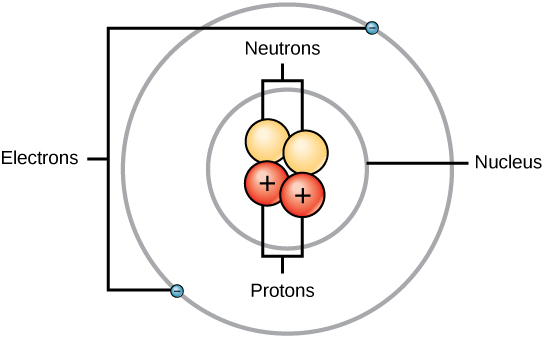 The hydrogen atom (H) contains only one proton, one electron, and no neutrons. This can be determined using the atomic number and the mass number of the element (see the concept on atomic numbers and mass numbers). Structure of an atom: Elements, such as helium, depicted here, are made up of atoms. Atoms are made up of protons and neutrons located within the nucleus, with electrons in orbitals surrounding the nucleus. Protons and neutrons have approximately the same mass, about 1.67 × 10-24 grams. Scientists define this amount of mass as one atomic mass unit (amu) or one Dalton. 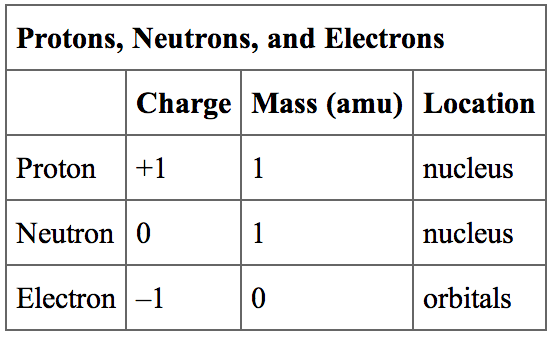 Although similar in mass, protons are positively charged, while neutrons have no charge. Therefore, the number of neutrons in an atom contributes significantly to its mass, but not to its charge. Electrons are much smaller in mass than protons, weighing only 9.11 × 10-28 grams, or about 1/1800 of an atomic mass unit. Therefore, they do not contribute much to an element’s overall atomic mass. When considering atomic mass, it is customary to ignore the mass of any electrons and calculate the atom’s mass based on the number of protons and neutrons alone. Electrons contribute greatly to the atom’s charge, as each electron has a negative charge equal to the positive charge of a proton. Scientists define these charges as “+1” and “-1. ” In an uncharged, neutral atom, the number of electrons orbiting the nucleus is equal to the number of protons inside the nucleus. In these atoms, the positive and negative charges cancel each other out, leading to an atom with no net charge. Protons, neutrons, and electrons: Both protons and neutrons have a mass of 1 amu and are found in the nucleus. However, protons have a charge of +1, and neutrons are uncharged. Electrons have a mass of approximately 0 amu, orbit the nucleus, and have a charge of -1. Exploring Electron Properties: Compare the behavior of electrons to that of other charged particles to discover properties of electrons such as charge and mass. Accounting for the sizes of protons, neutrons, and electrons, most of the volume of an atom—greater than 99 percent—is, in fact, empty space. Despite all this empty space, solid objects do not just pass through one another. The electrons that surround all atoms are negatively charged and cause atoms to repel one another, preventing atoms from occupying the same space. These intermolecular forces prevent you from falling through an object like your chair. Interactive: Build an Atom: Build an atom out of protons, neutrons, and electrons, and see how the element, charge, and mass change. Then play a game to test your ideas! The atomic number is the number of protons in an element, while the mass number is the number of protons plus the number of neutrons. Neutral atoms of each element contain an equal number of protons and electrons. The number of protons determines an element’s atomic number and is used to distinguish one element from another. The number of neutrons is variable, resulting in isotopes, which are different forms of the same atom that vary only in the number of neutrons they possess. Together, the number of protons and the number of neutrons determine an element’s mass number. Since an element’s isotopes have slightly different mass numbers, the atomic mass is calculated by obtaining the mean of the mass numbers for its isotopes. mass number: The sum of the number of protons and the number of neutrons in an atom. atomic number: The number of protons in an atom. atomic mass: The average mass of an atom, taking into account all its naturally occurring isotopes. Neutral atoms of an element contain an equal number of protons and electrons. The number of protons determines an element’s atomic number (Z) and distinguishes one element from another. For example, carbon’s atomic number (Z) is 6 because it has 6 protons. The number of neutrons can vary to produce isotopes, which are atoms of the same element that have different numbers of neutrons. The number of electrons can also be different in atoms of the same element, thus producing ions (charged atoms). For instance, iron, Fe, can exist in its neutral state, or in the +2 and +3 ionic states. An element’s mass number (A) is the sum of the number of protons and the number of neutrons. The small contribution of mass from electrons is disregarded in calculating the mass number. This approximation of mass can be used to easily calculate how many neutrons an element has by simply subtracting the number of protons from the mass number. Protons and neutrons both weigh about one atomic mass unit or amu. Isotopes of the same element will have the same atomic number but different mass numbers. Atomic number, chemical symbol, and mass number: Carbon has an atomic number of six, and two stable isotopes with mass numbers of twelve and thirteen, respectively. Its average atomic mass is 12.11. Scientists determine the atomic mass by calculating the mean of the mass numbers for its naturally-occurring isotopes. Often, the resulting number contains a decimal. For example, the atomic mass of chlorine (Cl) is 35.45 amu because chlorine is composed of several isotopes, some (the majority) with an atomic mass of 35 amu (17 protons and 18 neutrons) and some with an atomic mass of 37 amu (17 protons and 20 neutrons). Given an atomic number (Z) and mass number (A), you can find the number of protons, neutrons, and electrons in a neutral atom. For example, a lithium atom (Z=3, A=7 amu) contains three protons (found from Z), three electrons (as the number of protons is equal to the number of electrons in an atom), and four neutrons (7 – 3 = 4). Isotopes are various forms of an element that have the same number of protons, but a different number of neutrons. Isotopes are atoms of the same element that contain an identical number of protons, but a different number of neutrons. Despite having different numbers of neutrons, isotopes of the same element have very similar physical properties. Some isotopes are unstable and will undergo radioactive decay to become other elements. The predictable half-life of different decaying isotopes allows scientists to date material based on its isotopic composition, such as with Carbon-14 dating. isotope: Any of two or more forms of an element where the atoms have the same number of protons, but a different number of neutrons within their nuclei. half-life: The time it takes for half of the original concentration of an isotope to decay back to its more stable form. radioactive isotopes: an atom with an unstable nucleus, characterized by excess energy available that undergoes radioactive decay and creates most commonly gamma rays, alpha or beta particles. radiocarbon dating: Determining the age of an object by comparing the ratio of the 14C concentration found in it to the amount of 14C in the atmosphere. Isotopes are various forms of an element that have the same number of protons but a different number of neutrons. Some elements, such as carbon, potassium, and uranium, have multiple naturally-occurring isotopes. Isotopes are defined first by their element and then by the sum of the protons and neutrons present. Carbon-12 (or 12C) contains six protons, six neutrons, and six electrons; therefore, it has a mass number of 12 amu (six protons and six neutrons). Carbon-14 (or 14C) contains six protons, eight neutrons, and six electrons; its atomic mass is 14 amu (six protons and eight neutrons). While the mass of individual isotopes is different, their physical and chemical properties remain mostly unchanged. Isotopes do differ in their stability. Carbon-12 (12C) is the most abundant of the carbon isotopes, accounting for 98.89% of carbon on Earth. Carbon-14 (14C) is unstable and only occurs in trace amounts. Unstable isotopes most commonly emit alpha particles (He2+) and electrons. Neutrons, protons, and positrons can also be emitted and electrons can be captured to attain a more stable atomic configuration (lower level of potential energy ) through a process called radioactive decay. The new atoms created may be in a high energy state and emit gamma rays which lowers the energy but alone does not change the atom into another isotope. These atoms are called radioactive isotopes or radioisotopes. Carbon is normally present in the atmosphere in the form of gaseous compounds like carbon dioxide and methane. Carbon-14 (14C) is a naturally-occurring radioisotope that is created from atmospheric 14N (nitrogen) by the addition of a neutron and the loss of a proton, which is caused by cosmic rays. This is a continuous process so more 14C is always being created in the atmosphere. Once produced, the 14C often combines with the oxygen in the atmosphere to form carbon dioxide. Carbon dioxide produced in this way diffuses in the atmosphere, is dissolved in the ocean, and is incorporated by plants via photosynthesis. Animals eat the plants and, ultimately, the radiocarbon is distributed throughout the biosphere. In living organisms, the relative amount of 14C in their body is approximately equal to the concentration of 14C in the atmosphere. When an organism dies, it is no longer ingesting 14C, so the ratio between 14C and 12C will decline as 14C gradually decays back to 14N. This slow process, which is called beta decay, releases energy through the emission of electrons from the nucleus or positrons. After approximately 5,730 years, half of the starting concentration of 14C will have been converted back to 14N. This is referred to as its half-life, or the time it takes for half of the original concentration of an isotope to decay back to its more stable form. Because the half-life of 14C is long, it is used to date formerly-living objects such as old bones or wood. Comparing the ratio of the 14C concentration found in an object to the amount of 14C in the atmosphere, the amount of the isotope that has not yet decayed can be determined. On the basis of this amount, the age of the material can be accurately calculated, as long as the material is believed to be less than 50,000 years old. This technique is called radiocarbon dating, or carbon dating for short. 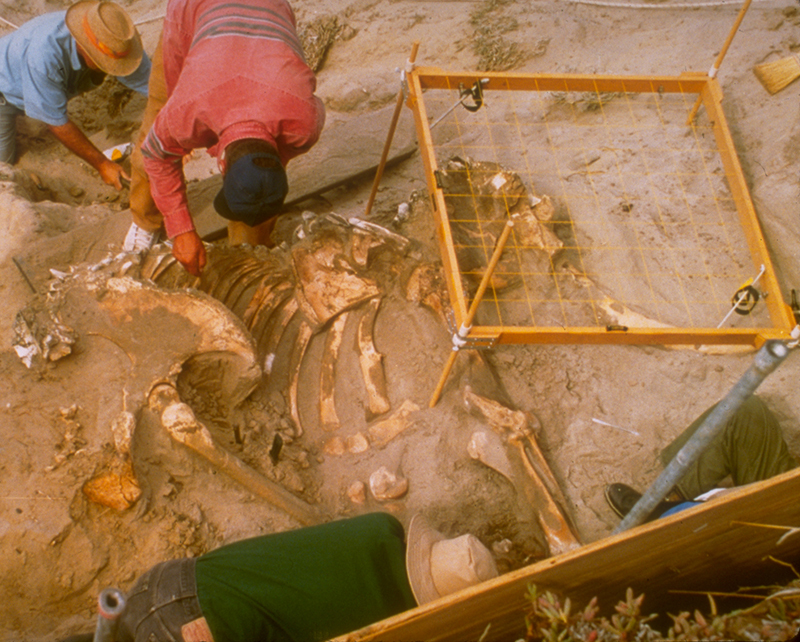 Application of carbon dating: The age of carbon-containing remains less than 50,000 years old, such as this pygmy mammoth, can be determined using carbon dating. Other elements have isotopes with different half lives. For example, 40K (potassium-40) has a half-life of 1.25 billion years, and 235U (uranium-235) has a half-life of about 700 million years. Scientists often use these other radioactive elements to date objects that are older than 50,000 years (the limit of carbon dating). Through the use of radiometric dating, scientists can study the age of fossils or other remains of extinct organisms. Everything in the universe is made of one or more elements. The periodic table is a means of organizing the various elements according to similar physical and chemical properties. All matter is made from atoms of one or more elements. Living creatures consist mainly of carbon, hydrogen, oxygen, and nitrogen (CHON). Combining elements creates compounds that may have emergent properties. The periodic table is a listing of the elements according to increasing atomic number that is further organized into columns based on similar physical and chemical properties and electron configuration. As one moves down a column or across a row, there are some general trends for the properties of the elements. The periodic table continues to expand today as heavier and heavier elements are created in laboratories around the world. element: Pure chemical substances consisting of only one type of atom with a defined set of chemical and physical properties. emergent properties: Properties found in compound structures that are different from those of the individual components and would not be predicted based on the properties of the individual components. periodic table: A tabular chart of the chemical elements according to their atomic numbers so that elements with similar properties are in the same column. Matter comprises all of the physical objects in the universe, those that take up space and have mass. All matter is composed of atoms of one or more elements, pure substances with specific chemical and physical properties. There are 98 elements that naturally occur on earth, yet living systems use a relatively small number of these. Living creatures are composed mainly of just four elements: carbon, hydrogen, oxygen, and nitrogen (often remembered by the acronym CHON). As elements are bonded together they form compounds that often have new emergent properties that are different from the properties of the individual elements. Life is an example of an emergent property that arises from the specific collection of molecules found in cells. Elements of the human body arranged by percent of total mass: There are 25 elements believed to play an active role in human health. Carbon, hydrogen, oxygen, and nitrogen make up approximately 96% of the mass in a human body. The different elements are organized and displayed in the periodic table. Devised by Russian chemist Dmitri Mendeleev (1834–1907) in 1869, the table groups elements that, although unique, share certain chemical properties with other elements. In the periodic table the elements are organized and displayed according to their atomic number and are arranged in a series of rows (periods) and columns (groups) based on shared chemical and physical properties. If you look at a periodic table, you will see the groups numbered at the top of each column from left to right starting with 1 and ending with 18. In addition to providing the atomic number for each element, the periodic table also displays the element’s atomic mass. Looking at carbon, for example, its symbol (C) and name appear, as well as its atomic number of six (in the upper left-hand corner) and its atomic mass of 12.11. The periodic table: The periodic table shows the atomic mass and atomic number of each element. The atomic number appears above the symbol for the element and the approximate atomic mass appears below it. 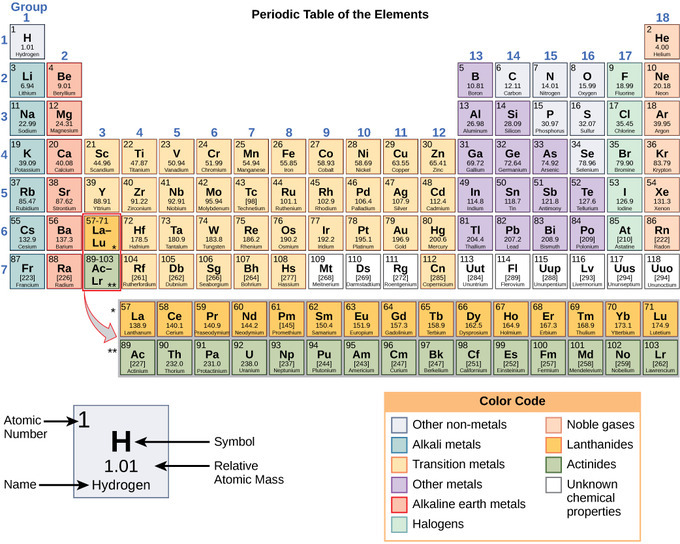 The arrangement of the periodic table allows the elements to be grouped according to their chemical properties. Within the main group elements ( Groups 1-2, 13-18), there are some general trends that we can observe. The further down a given group, the elements have an increased metallic character: they are good conductors of both heat and electricity, solids at room temperature, and shiny in appearance. Moving from left to right across a period, the elements have greater non-metallic character. These elements are insulators, poor heat conductors, and can exist in different phases at room temperature (brittle solid, liquid, or gas). The elements at the boundary between the metallic elements (grey elements) and nonmetal elements (green elements) are metalloid in character (pink elements). They have low electrical conductivity that increases with temperature. They also share properties with both the metals and the nonmetals. 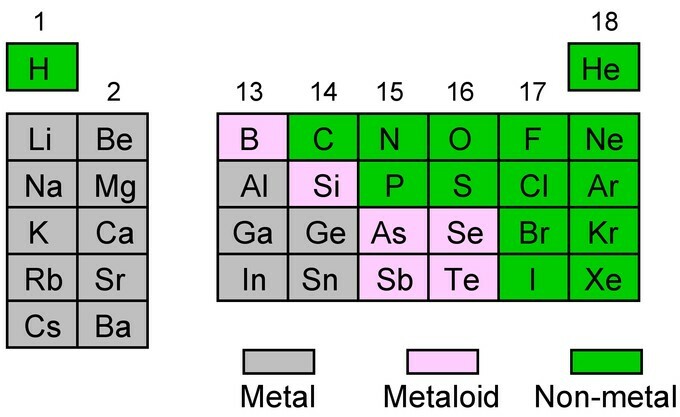 The main group elements: Within the p-block at the boundary between the metallic elements (grey elements) and nonmetal elements (green elements) there is positioned boron and silicon that are metalloid in character (pink elements), i.e., they have low electrical conductivity that increases with temperature. Today, the periodic table continues to expand as heavier and heavier elements are synthesized in laboratories. These large elements are extremely unstable and, as such, are very difficult to detect; but their continued creation is an ongoing challenge undertaken by scientists around the world. Niels Bohr proposed an early model of the atom as a central nucleus containing protons and neutrons being orbited by electrons in shells. In the Bohr model of the atom, the nucleus contains the majority of the mass of the atom in its protons and neutrons. Orbiting the positively-charged core are the negatively charged electrons, which contribute little in terms of mass, but are electrically equivalent to the protons in the nucleus. In most cases, electrons fill the lower- energy orbitals first, followed by the next higher energy orbital until it is full, and so on until all electrons have been placed. Atoms tend to be most stable with a full outer shell (one which, after the first, contains 8 electrons), leading to what is commonly called the ” octet rule “. The properties of an element are determined by its outermost electrons, or those in the highest energy orbital. Atoms that do not have full outer shells will tend to gain or lose electrons, resulting in a full outer shell and, therefore, stability. electron shell: The collective states of all electrons in an atom having the same principal quantum number (visualized as an orbit in which the electrons move). Orbitals in the Bohr model: The Bohr model was developed by Niels Bohr in 1913. In this model, electrons exist within principal shells. An electron normally exists in the lowest energy shell available, which is the one closest to the nucleus. Energy from a photon of light can bump it up to a higher energy shell, but this situation is unstable and the electron quickly decays back to the ground state. In the process, a photon of light is released. As previously discussed, there is a connection between the number of protons in an element, the atomic number that distinguishes one element from another, and the number of electrons it has. In all electrically-neutral atoms, the number of electrons is the same as the number of protons. Each element, when electrically neutral, has a number of electrons equal to its atomic number. An early model of the atom was developed in 1913 by Danish scientist Niels Bohr (1885–1962). The Bohr model shows the atom as a central nucleus containing protons and neutrons with the electrons in circular orbitals at specific distances from the nucleus. These orbits form electron shells or energy levels, which are a way of visualizing the number of electrons in the various shells. These energy levels are designated by a number and the symbol “n.” For example, 1n represents the first energy level located closest to the nucleus. Electrons fill orbit shells in a consistent order. Under standard conditions, atoms fill the inner shells (closer to the nucleus) first, often resulting in a variable number of electrons in the outermost shell. The innermost shell has a maximum of two electrons, but the next two electron shells can each have a maximum of eight electrons. This is known as the octet rule which states that, with the exception of the innermost shell, atoms are more stable energetically when they have eight electrons in their valence shell, the outermost electron shell. Examples of some neutral atoms and their electron configurations are shown in. As shown, helium has a complete outer electron shell, with two electrons filling its first and only shell. Similarly, neon has a complete outer 2n shell containing eight electrons. In contrast, chlorine and sodium have seven and one electrons in their outer shells, respectively. Theoretically, they would be more energetically stable if they followed the octet rule and had eight. Bohr diagrams: Bohr diagrams indicate how many electrons fill each principal shell. Group 18 elements (helium, neon, and argon are shown) have a full outer, or valence, shell. A full valence shell is the most stable electron configuration. Elements in other groups have partially-filled valence shells and gain or lose electrons to achieve a stable electron configuration. An atom may gain or lose electrons to achieve a full valence shell, the most stable electron configuration. The periodic table is arranged in columns and rows based on the number of electrons and where these electrons are located, providing a tool to understand how electrons are distributed in the outer shell of an atom. 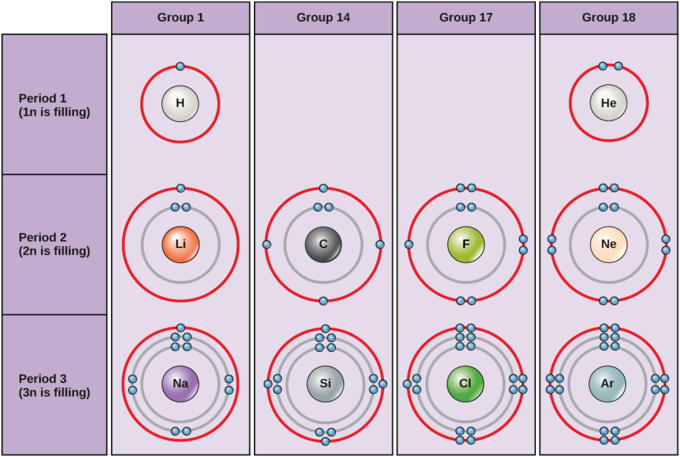 As shown in, the group 18 atoms helium (He), neon (Ne), and argon (Ar) all have filled outer electron shells, making it unnecessary for them to gain or lose electrons to attain stability; they are highly stable as single atoms. Their non-reactivity has resulted in their being named the inert gases (or noble gases). In comparison, the group 1 elements, including hydrogen (H), lithium (Li), and sodium (Na), all have one electron in their outermost shells. This means that they can achieve a stable configuration and a filled outer shell by donating or losing an electron. As a result of losing a negatively-charged electron, they become positively-charged ions. 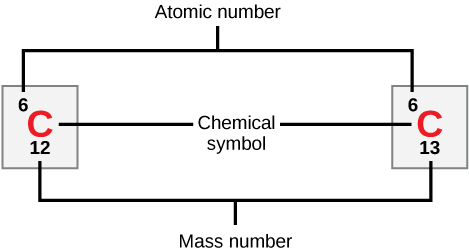 When an atom loses an electron to become a positively-charged ion, this is indicated by a plus sign after the element symbol; for example, Na+. 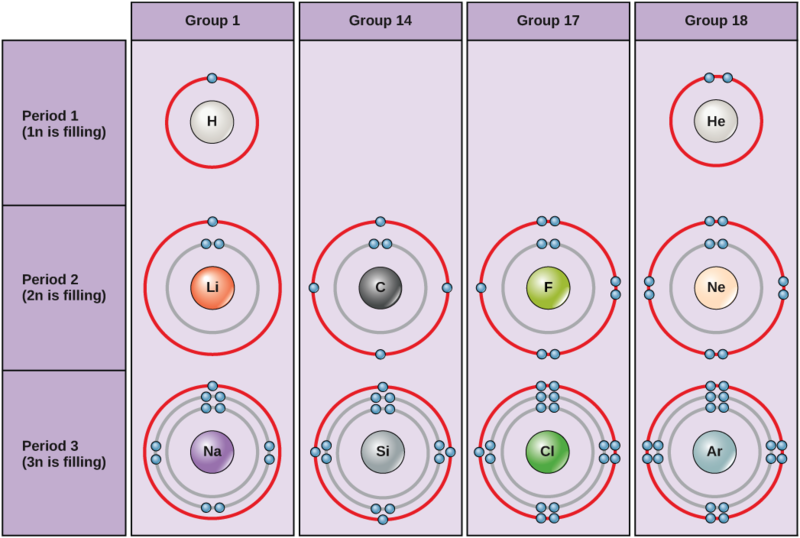 Group 17 elements, including fluorine and chlorine, have seven electrons in their outermost shells; they tend to fill this shell by gaining an electron from other atoms, making them negatively-charged ions. When an atom gains an electron to become a negatively-charged ion this is indicated by a minus sign after the element symbol; for example, F-. Thus, the columns of the periodic table represent the potential shared state of these elements’ outer electron shells that is responsible for their similar chemical characteristics. Electron orbitals are three-dimensional representations of the space in which an electron is likely to be found. The Bohr model of the atom does not accurately reflect how electrons are spatially distributed around the nucleus as they do not circle the nucleus like the earth orbits the sun. The electron orbitals are the result of mathematical equations from quantum mechanics known as wave functions and can predict within a certain level of probability where an electron might be at any given time. The number and type of orbitals increases with increasing atomic number, filling in various electron shells. The area where an electron is most likely to be found is called its orbital. orbital: A specification of the energy and probability density of an electron at any point in an atom or molecule. Although useful to explain the reactivity and chemical bonding of certain elements, the Bohr model of the atom does not accurately reflect how electrons are spatially distributed surrounding the nucleus. They do not circle the nucleus like the earth orbits the sun, but are rather found in electron orbitals. These relatively complex shapes result from the fact that electrons behave not just like particles, but also like waves. Mathematical equations from quantum mechanics known as wave functions can predict within a certain level of probability where an electron might be at any given time. The area where an electron is most likely to be found is called its orbital. The closest orbital to the nucleus, called the 1s orbital, can hold up to two electrons. This orbital is equivalent to the innermost electron shell of the Bohr model of the atom. It is called the 1s orbital because it is spherical around the nucleus. The 1s orbital is always filled before any other orbital. Hydrogen has one electron; therefore, it has only one spot within the 1s orbital occupied. This is designated as 1s1, where the superscripted 1 refers to the one electron within the 1s orbital. Helium has two electrons; therefore, it can completely fill the 1s orbital with its two electrons. This is designated as 1s2, referring to the two electrons of helium in the 1s orbital. On the periodic table, hydrogen and helium are the only two elements in the first row (period); this is because they are the sole elements to have electrons only in their first shell, the 1s orbital. The second electron shell may contain eight electrons. This shell contains another spherical s orbital and three “dumbbell” shaped p orbitals, each of which can hold two electrons. After the 1s orbital is filled, the second electron shell is filled, first filling its 2s orbital and then its three p orbitals. When filling the p orbitals, each takes a single electron; once each p orbital has an electron, a second may be added. Lithium (Li) contains three electrons that occupy the first and second shells. Two electrons fill the 1s orbital, and the third electron then fills the 2s orbital. Its electron configuration is 1s22s1. Neon (Ne), on the other hand, has a total of ten electrons: two are in its innermost 1s orbital, and eight fill its second shell (two each in the 2s and three p orbitals). Thus, it is an inert gas and energetically stable: it rarely forms a chemical bond with other atoms. Diagram of the S and P orbitals: The s subshells are shaped like spheres. 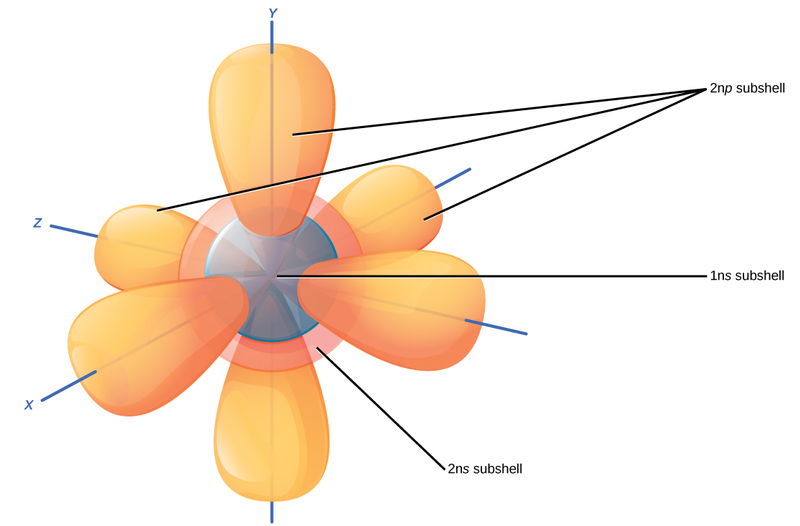 Both the 1n and 2n principal shells have an s orbital, but the size of the sphere is larger in the 2n orbital. Each sphere is a single orbital. p subshells are made up of three dumbbell-shaped orbitals. Principal shell 2n has a p subshell, but shell 1 does not. Larger elements have additional orbitals, making up the third electron shell. Subshells d and f have more complex shapes and contain five and seven orbitals, respectively. Principal shell 3n has s, p, and d subshells and can hold 18 electrons. Principal shell 4n has s, p, d, and f orbitals and can hold 32 electrons. Moving away from the nucleus, the number of electrons and orbitals found in the energy levels increases. Progressing from one atom to the next in the periodic table, the electron structure can be worked out by fitting an extra electron into the next available orbital. While the concepts of electron shells and orbitals are closely related, orbitals provide a more accurate depiction of the electron configuration of an atom because the orbital model specifies the different shapes and special orientations of all the places that electrons may occupy. Chemical reactions occur when two or more atoms bond together to form molecules or when bonded atoms are broken apart. Atoms form chemical bonds with other atoms thereby obtaining the electrons they need to attain a stable electron configuration. The substances used in the beginning of a chemical reaction are called the reactants and the substances found at the end of the reaction are known as the products. Some reactions are reversible and will reach a relative balance between reactants and products: a state called equilibrium. An arrow is typically drawn between the reactants and products to indicate the direction of the chemical reaction. reactant: Any of the participants present at the start of a chemical reaction. molecule: The smallest particle of a specific compound that retains the chemical properties of that compound; two or more atoms held together by chemical bonds. According to the octet rule, elements are most stable when their outermost shell is filled with electrons. This is because it is energetically favorable for atoms to be in that configuration. However, since not all elements have enough electrons to fill their outermost shells, atoms form chemical bonds with other atoms, which helps them obtain the electrons they need to attain a stable electron configuration. When two or more atoms chemically bond with each other, the resultant chemical structure is a molecule. 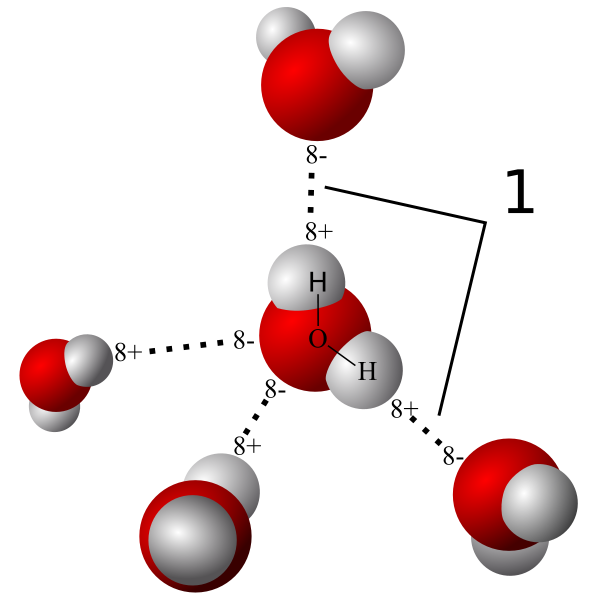 The familiar water molecule, H2O, consists of two hydrogen atoms and one oxygen atom, which bond together to form water. Atoms can form molecules by donating, accepting, or sharing electrons to fill their outer shells. Atoms bond to form molecules: Two or more atoms may bond with each other to form a molecule. When two hydrogens and an oxygen share electrons via covalent bonds, a water molecule is formed. An example of a simple chemical reaction is the breaking down of hydrogen peroxide molecules, each of which consists of two hydrogen atoms bonded to two oxygen atoms (H2O2). The reactant hydrogen peroxide is broken down into water (H2O), and oxygen, which consists of two bonded oxygen atoms (O2). In the equation below, the reaction includes two hydrogen peroxide molecules and two water molecules. This is an example of a balanced chemical equation, wherein the number of atoms of each element is the same on each side of the equation. According to the law of conservation of matter, the number of atoms before and after a chemical reaction should be equal, such that no atoms are, under normal circumstances, created or destroyed. Even though all of the reactants and products of this reaction are molecules (each atom remains bonded to at least one other atom), in this reaction only hydrogen peroxide and water are representative of a subclass of molecules known as compounds: they contain atoms of more than one type of element. Molecular oxygen, on the other hand, consists of two doubly bonded oxygen atoms and is not classified as a compound but as an element. Some chemical reactions, such as the one shown above, can proceed in one direction until the reactants are all used up. The equations that describe these reactions contain a unidirectional arrow and are irreversible. Reversible reactions are those that can go in either direction. In reversible reactions, reactants are turned into products, but when the concentration of product goes beyond a certain threshold, some of these products will be converted back into reactants; at this point, the designations of products and reactants are reversed. This back and forth continues until a certain relative balance between reactants and products occurs: a state called equilibrium. These situations of reversible reactions are often denoted by a chemical equation with a double headed arrow pointing towards both the reactants and products. For example, in human blood, excess hydrogen ions (H+) bind to bicarbonate ions (HCO3–) forming an equilibrium state with carbonic acid (H2CO3). If carbonic acid were added to this system, some of it would be converted to bicarbonate and hydrogen ions. In biological reactions, however, equilibrium is rarely obtained because the concentrations of the reactants or products or both are constantly changing, often with a product of one reaction being a reactant for another. To return to the example of excess hydrogen ions in the blood, the formation of carbonic acid will be the major direction of the reaction. However, the carbonic acid can also leave the body as carbon dioxide gas (via exhalation) instead of being converted back to bicarbonate ion, thus driving the reaction to the right by the chemical law known as law of mass action. These reactions are important for maintaining the homeostasis of our blood. Interactive: What is a Chemical Reaction? : Explore reactions in which chemical bonds are formed and broken with this model. Press run, then try heating and cooling the atoms to see how temperature affects the balance between bond formation and breaking. Ionic bonds are attractions between oppositely charged atoms or groups of atoms where electrons are donated and accepted. Ions form from elements when they gain or lose an electron causing the number of protons to be unequal to the number of electrons, resulting in a net charge. If there are more electrons than protons (from an element gaining one or more electrons), the ion is negatively charged and called an anion. If there are more protons than electrons (via loss of electrons), the ion is positively charged and is called a cation. Ionic bonds result from the interaction between a positively charged cation and a negatively charged anion. ion: An atom, or group of atoms, bearing an electrical charge, such as the sodium and chlorine atoms in a salt solution. ionic bond: A strong chemical bond caused by the electrostatic attraction between two oppositely charged ions. Some atoms are more stable when they gain or lose an electron (or possibly two) and form ions. This results in a full outermost electron shell and makes them energetically more stable. Now, because the number of electrons does not equal the number of protons, each ion has a net charge. Cations are positive ions that are formed by losing electrons (as the number of protons is now greater than the number of electrons). Negative ions are formed by gaining electrons and are called anions (wherein there are more electrons than protons in a molecule ). Anions are designated by their elemental name being altered to end in “-ide”. For example, the anion of chlorine is called chloride, and the anion of sulfur is called sulfide. This movement of electrons from one element to another is referred to as electron transfer. As illustrated, sodium (Na) only has one electron in its outer electron shell. It takes less energy for sodium to donate that one electron than it does to accept seven more electrons to fill the outer shell. When sodium loses an electron, it will have 11 protons, 11 neutrons, and only 10 electrons. This leaves it with an overall charge of +1 since there are now more protons than electrons. It is now referred to as a sodium ion. Chlorine (Cl) in its lowest energy state (called the ground state) has seven electrons in its outer shell. Again, it is more energy efficient for chlorine to gain one electron than to lose seven. Therefore, it tends to gain an electron to create an ion with 17 protons, 17 neutrons, and 18 electrons. This gives it a net charge of -1 since there are now more electrons than protons. It is now referred to as a chloride ion. In this example, sodium will donate its one electron to empty its shell, and chlorine will accept that electron to fill its shell. Both ions now satisfy the octet rule and have complete outer shells. These transactions can normally only take place simultaneously; in order for a sodium atom to lose an electron, it must be in the presence of a suitable recipient like a chlorine atom. Electron Transfer Between Na and Cl: In the formation of an ionic compound, metals lose electrons and nonmetals gain electrons to achieve an octet. In this example, sodium loses one electron to empty its shell and chlorine accepts that electron to fill its shell. Ionic bonds are formed between ions with opposite charges. For instance, positively charged sodium ions and negatively charged chloride ions bond together to form sodium chloride, or table salt, a crystalline molecule with zero net charge. The attractive force holding the two atoms together is called the electromagnetic force and is responsible for the attraction between oppositely charged ions. Certain salts are referred to in physiology as electrolytes (including sodium, potassium, and calcium). Electrolytes are ions necessary for nerve impulse conduction, muscle contractions, and water balance. Many sports drinks and dietary supplements provide these ions to replace those lost from the body via sweating during exercise. Covalent bonds result from a sharing of electrons between two atoms and hold most biomolecules together. A polar covalent bond arises when two atoms of different electronegativity share two electrons unequally. A non-polar covalent bond is one in which the electrons are shared equally between two atoms. Hydrogen bonds and Van Der Waals are responsible for the folding of proteins, the binding of ligands to proteins, and many other processes between molecules. hydrogen bond: A weak bond in which a hydrogen atom in one molecule is attracted to an electronegative atom (usually nitrogen or oxygen) in the same or different molecule. covalent bond: A type of chemical bond where two atoms are connected to each other by the sharing of two or more electrons. dipole: Any object (such as a magnet, polar molecule or antenna), that is oppositely charged at two points (or poles). The octet rule can be satisfied by the sharing of electrons between atoms to form covalent bonds. These bonds are stronger and much more common than are ionic bonds in the molecules of living organisms. Covalent bonds are commonly found in carbon-based organic molecules, such as DNA and proteins. Covalent bonds are also found in inorganic molecules such as H2O, CO2, and O2. One, two, or three pairs of electrons may be shared between two atoms, making single, double, and triple bonds, respectively. The more covalent bonds between two atoms, the stronger their connection. Thus, triple bonds are the strongest. The strength of different levels of covalent bonding is one of the main reasons living organisms have a difficult time in acquiring nitrogen for use in constructing nitrogenous molecules, even though molecular nitrogen, N2, is the most abundant gas in the atmosphere. Molecular nitrogen consists of two nitrogen atoms triple bonded to each other. The resulting strong triple bond makes it difficult for living systems to break apart this nitrogen in order to use it as constituents of biomolecules, such as proteins, DNA, and RNA. The formation of water molecules is an example of covalent bonding. The hydrogen and oxygen atoms that combine to form water molecules are bound together by covalent bonds. The electron from the hydrogen splits its time between the incomplete outer shell of the hydrogen atom and the incomplete outer shell of the oxygen atom. In return, the oxygen atom shares one of its electrons with the hydrogen atom, creating a two-electron single covalent bond. To completely fill the outer shell of oxygen, which has six electrons in its outer shell, two electrons (one from each hydrogen atom) are needed. Each hydrogen atom needs only a single electron to fill its outer shell, hence the well-known formula H2O. The electrons that are shared between the two elements fill the outer shell of each, making both elements more stable. There are two types of covalent bonds: polar and nonpolar. In a polar covalent bond, the electrons are unequally shared by the atoms because they are more attracted to one nucleus than the other. The relative attraction of an atom to an electron is known as its electronegativity: atoms that are more attracted to an electron are considered to be more electronegative. Because of the unequal distribution of electrons between the atoms of different elements, a slightly positive (δ+) or slightly negative (δ-) charge develops. This partial charge is known as a dipole; this is an important property of water and accounts for many of its characteristics. The dipole in water occurs because oxygen has a higher electronegativity than hydrogen, which means that the shared electrons spend more time in the vicinity of the oxygen nucleus than they do near the nucleus of the hydrogen atoms. 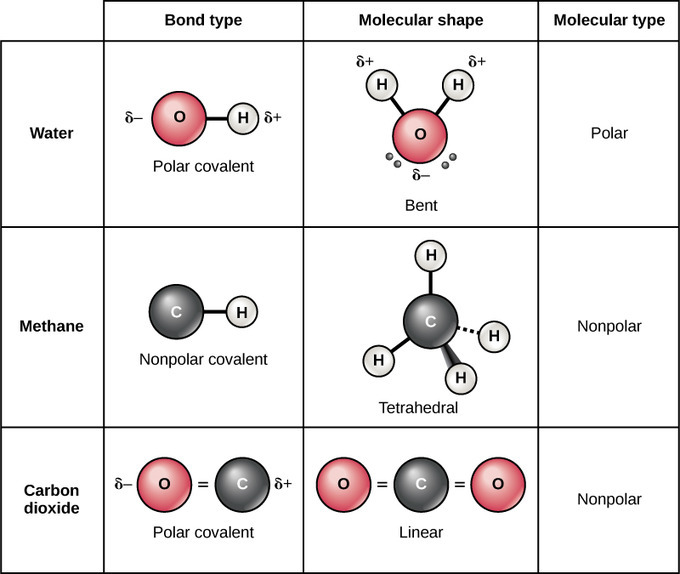 Polar and Nonpolar Covalent Bonds: Whether a molecule is polar or nonpolar depends both on bond type and molecular shape. Both water and carbon dioxide have polar covalent bonds, but carbon dioxide is linear, so the partial charges on the molecule cancel each other out. Nonpolar covalent bonds form between two atoms of the same element or between different elements that share electrons equally. For example, molecular oxygen (O2) is nonpolar because the electrons will be equally distributed between the two oxygen atoms. The four bonds of methane are also considered to be nonpolar because the electronegativies of carbon and hydrogen are nearly identical. Not all bonds are ionic or covalent; weaker bonds can also form between molecules. Two types of weak bonds that frequently occur are hydrogen bonds and van der Waals interactions. Without these two types of bonds, life as we know it would not exist. Hydrogen bonds provide many of the critical, life-sustaining properties of water and also stabilize the structures of proteins and DNA, the building block of cells. When polar covalent bonds containing hydrogen are formed, the hydrogen atom in that bond has a slightly positive charge (δ+) because the shared electrons are pulled more strongly toward the other element and away from the hydrogen atom. Because the hydrogen has a slightly positive charge, it’s attracted to neighboring negative charges. The weak interaction between the δ+ charge of a hydrogen atom from one molecule and the δ- charge of a more electronegative atom is called a hydrogen bond. Individual hydrogen bonds are weak and easily broken; however, they occur in very large numbers in water and in organic polymers, and the additive force can be very strong. For example, hydrogen bonds are responsible for zipping together the DNA double helix. Adenosine Triphosphate, ATP: Adenosine Triphosphate, or ATP, is the most commonly used cofactor in nature. Its biosynthesis involves the fixation of nitrogen to provide feedstocks that eventually produce the carbon-nitrogen bonds it contains. Like hydrogen bonds, van der Waals interactions are weak interactions between molecules. Van der Waals attractions can occur between any two or more molecules and are dependent on slight fluctuations of the electron densities, which can lead to slight temporary dipoles around a molecule. For these attractions to happen, the molecules need to be very close to one another. These bonds, along with hydrogen bonds, help form the three-dimensional structures of the proteins in our cells that are required for their proper function. Interactions between different types of molecules: In this interactive, you can explore how different types of molecules interact with each other based on their bonds. Hydrogen bonds and van der Waals interactions are two types of weak bonds that are necessary to the basic building blocks of life. Hydrogen bonds provide many of the critical, life-sustaining properties of water and also stabilize the structures of proteins and DNA, the building block of cells. Hydrogen bonds occur in inorganic molecules, such as water, and organic molecules, such as DNA and proteins. Van der Waals attractions can occur between any two or more molecules and are dependent on slight fluctuations of the electron densities. While hydrogen bonds and van der Waals interactions are weak individually, they are strong combined in vast numbers. van der Waals interactions: A weak force of attraction between electrically neutral molecules that collide with or pass very close to each other. The van der Waals force is caused by temporary attractions between electron-rich regions of one molecule and electron-poor regions of another. electronegativity: The tendency of an atom or molecule to draw electrons towards itself, form dipoles, and thus form bonds. hydrogen bond: The attraction between a partially positively-charged hydrogen atom attached to a highly electronegative atom (such as nitrogen, oxygen, or fluorine) and another nearby electronegative atom. Ionic and covalent bonds between elements require energy to break. Ionic bonds are not as strong as covalent, which determines their behavior in biological systems. However, not all bonds are ionic or covalent bonds. Weaker bonds can also form between molecules. Two weak bonds that occur frequently are hydrogen bonds and van der Waals interactions. Hydrogen bonds between water molecules: The slightly negative oxygen side of the water molecule and the slightly positive hydrogen side of the water molecule are attracted to each other and form a hydrogen bond. Hydrogen bonds provide many of the critical, life-sustaining properties of water and also stabilize the structures of proteins and DNA, the building block of cells. When polar covalent bonds containing hydrogen form, the hydrogen in that bond has a slightly positive charge because hydrogen’s one electron is pulled more strongly toward the other element and away from the hydrogen. Because the hydrogen is slightly positive, it will be attracted to neighboring negative charges. When this happens, an interaction occurs between the δ+of the hydrogen from one molecule and the δ– charge on the more electronegative atoms of another molecule, usually oxygen or nitrogen, or within the same molecule. This interaction is called a hydrogen bond. This type of bond is common and occurs regularly between water molecules. Individual hydrogen bonds are weak and easily broken; however, they occur in very large numbers in water and in organic polymers, creating a major force in combination. Hydrogen bonds are also responsible for zipping together the DNA double helix. Hydrogen bonds occur in inorganic molecules, such as water, and organic molecules, such as DNA and proteins. The two complementary strands of DNA are held together by hydrogen bonds between complementary nucleotides (A&T, C&G). Hydrogen bonding in water contributes to its unique properties, including its high boiling point (100 °C) and surface tension. Water droplets on a leaf: The hydrogen bonds formed between water molecules in water droplets are stronger than the other intermolecular forces between the water molecules and the leaf, contributing to high surface tension and distinct water droplets. In biology, intramolecular hydrogen bonding is partly responsible for the secondary, tertiary, and quaternary structures of proteins and nucleic acids. The hydrogen bonds help the proteins and nucleic acids form and maintain specific shapes. Like hydrogen bonds, van der Waals interactions are weak attractions or interactions between molecules. Van der Waals attractions can occur between any two or more molecules and are dependent on slight fluctuations of the electron densities, which are not always symmetrical around an atom. For these attractions to happen, the molecules need to be very close to one another. These bonds—along with ionic, covalent, and hydrogen bonds—contribute to the three-dimensional structure of proteins that is necessary for their proper function. Van der Waals attraction: Explore how Van der Waals attractions and temperature affect intermolecular interactions.